Asphalt Driveway Sinking | Why Is My Driveway Sinking? It is definitely upsetting when you notice a big dip in your driveway or your driveway or have a sinkhole in the middle of your driveway. Here you have a manicured lawn and a fresh coat of paint on your house but that darn driveway dip is all you can focus on. The common cause of your asphalt driveway sinking begins with not starting with a proper foundation. First, you need to have two inches of packing stone under the driveway. Then the stone needs to be properly packed. Without this solid foundation, the driveway tends to sink or settle. Once the two-inch foundation of packing stone is in place, a compaction machine is used to give the stone a tight pack. – Yes, Willies uses a compaction machine. If a crack appears in your driveway and you don’t repair it, problems will ensue. Water can seep into that crack, which will disturb the base, causing mud and eventually…a sinkhole. A broken water line or a busted sewer line can also cause a sinkhole. A water line break could go on for years before the problem is discovered. Eventually, the water causes decay to the ground underneath the stone base and under the asphalt. Driveways on a new home that develop a sinkhole within three years of purchase are probably caused by negligence. Builders tend to dig up trees and use the stumps as a base for the driveway. Stone is then filled in on top. Two years later, the stumps start to decay and thus the driveway begins to dip and sink. However, driveways that are properly filled with a stone base, packed and covered tend to last many years. Okay, Now I Know The Reason Why – What Should I Do? So now that you know why your driveway is sinking or has a sinkhole, what should be done about repairing my asphalt driveway? 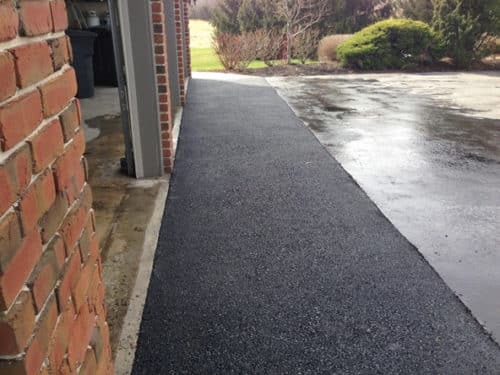 If the damage was caused by a water leak, the leak must be repaired, the area must be cleaned out and then we start from scratch to properly rebuild the section of driveway that was the problem. Homeowners who wish to repair their driveways themselves we would encourage you to try Cold Patch, available for purchase at Lowe’s or Home Depot. It is good for a little while, but on hot summer days, it does not get hard like real asphalt. So it is for a temporary fix. 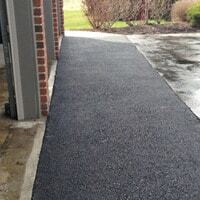 Give us a call at 717-932-8920 or use our paving contact form and we will be glad to check out your dipping driveway and get that taken care of ASAP.